Traditionally, in the olden days before the Russian revolution of 1917, the main church of a city was the center of the social life. And a square beside it - as well, that's where all the big city holidays began and took place. 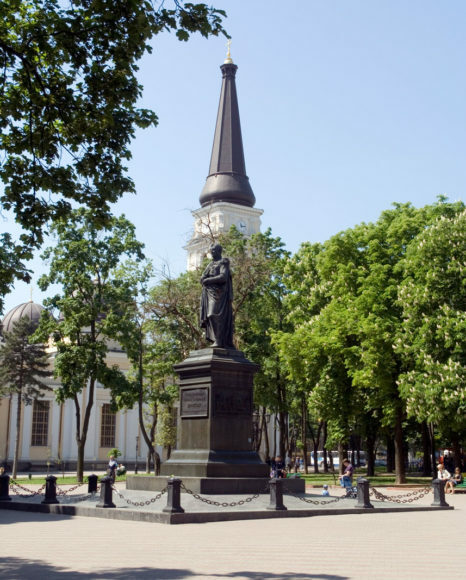 Such an area in Odessa was the Cathedral Square or Soborka, a place near the main church of Odessa and the whole Odessa region - the Transfiguration Cathedral. A broad street next to it was called Preobrazhenskaya (the word means "transfiguration"), and became the thoroughfare of the city center. 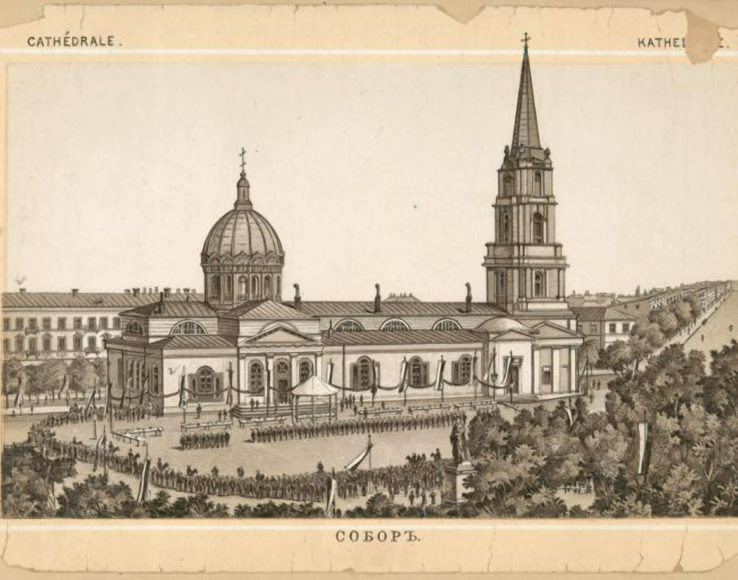 The future Cathedral Square was planned as a central one of the city by the first constructor of Odessa, Francois Sainte de Wollant. The church was built soon after the foundation of Odessa, as the Church of St. Nicholas the Wonderworker, patron saint of sailors, and was consecrated as a cathedral in 1808, in Duke de Richelieu's time as a Governor. In 1837 when Odessa became the eparchial centre, the Transfiguration church became a cathedral. The population of Odessa was constantly growing, bringing more parishioners, so there was a need to expand the cathedral. After that the cathedral lived through several more extentions and reconstructions, the last one completed in 1903, and 220 000 roubles were spent from the city's budget on this purpose. At that time two side domes were added to the cathedral and a portico - to the eastern facade. The main cathedral of Odessa became one of the largest in the Russian Empire and could house up to 9 000 people, the hight of its bellfry comprised 72 m.
In 1936, when religion was persecuted by communists, the cathedral was destroyed and ransacked ("Religion is the opium of the people", as Karl Marx once famously wrote). They say that the People's Commissar of Defense Klim Voroshilov, who visited Odessa, did not like the a grand church in the city center. To demolish the church, they thought up to blow up the bell tower so that it brought down the main building. The entire neighbourhood was shaken by a terrible crash, in Tolstoy street there broke down glass from the windows, although they were ordered to be sealed up. The Vorontsovs' burial vault was vandalized; but their remains were secretly buried by some Odessans in the Slobodskoye cemetery. There was an attempt to destroy the monument to Vorontsov, but it proved to be too strong and did not yield, so only the plate was replaced. 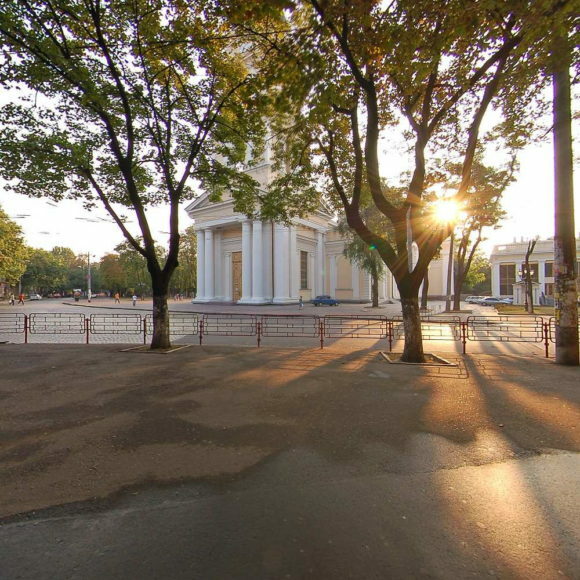 The Soviet authorities decided to set up an entertainment center instead of the cathedral, and put a public toilet on the place of the main altar. It took the efforts of the famous doctor and scientist Vladimir Filatov to help to avoid the desecration of the sacred palce - he managed to get the fountain with the vase in the shape of a flower built on the venue (the fountain was called by the people "the Filatov's vase"). In 2005 after the cathedral was rebuilt, the fountain was moved, but it still functions. Immediately after the fall of Communism there were talks about the return of the church in its place. Since 1996, the excavations began, the foundation of the cathedral was digged up. The rebuilding of the cathedral began in 1999 on the donations made by the citizens of Odessa. The construction expenditure including the planning work comprised 32 milliom hrivnyas. In spring 2005 the Transfiguration Cathedral, still under construction, was given to the Odessa metropole of the Ukrainian Orthodox Church. And in Novebmer of the same year the reburial of the Vorontsovs couple took place - the remains of the Prince Mikhail Semenovich and Elisaveta Ksaveryevna were moved back to the burial vault in the cathedral - and historical justice has been done. On the 200th anniversary of the Cathedral, the main bell was consecrated and put on top of the cathedral. It is the biggest one not only in Odessa, but also in Ukraine - its height is 3 meters and it weighs more than 14 tons. The bell was cast in Voronezh on the money donated by the citizens of Odessa. In July 2010, the Transfiguration Cathedral was consecrated by Patriarch of Moscow and all Rus' Kirill, during his visit to Odessa. Behind the cathedral around the fountain you can see the trade fair of Odessan artists and souvenir vendors, which used to be situated in the City Garden.